You can watch AMC Premiere live without cable with one of these streaming services: Philo, fuboTV, PlayStation Vue, DirecTV Now, YouTube TV or the AMC Premiere app. In this article, we’ll help you decide which option is best for you. Let’s get started! Keep reading to get the details about watching AMC Premiere live, or click the banner below to use our Cord-Cutter Express tool. Just answer a few quick questions and we'll match you to the perfect streaming service, taking into account all of your watching preferences. Philo made a splash when it launched by offering the lowest prices in the streaming TV business. There is, of course, a catch. You don’t get sports channels or local TV stations. Because AMC is included in Philo’s base subscription plan you can subscribe to AMC Premiere through the AMC Premiere app. For more information about Philo’s plans and pricing, click here. To keep the lowest prices, Philo chose not to offer the most expensive channels. As a result, none of the national broadcast channels or the sports channels are available through Philo. If you’re more interested in reality shows and entertainment, however, then Philo may be worth checking out. Besides AMC, a Philo subscription will give you access to Comedy Central, Food Network, the Hallmark Channel and more. The channel lineup mostly consists of lifestyle channels like these. The only news channels you get are the BBC World Service and Cheddar. The Game Show Network is the closest thing to a sports channel you’ll find on Philo. For more information about Philo’s channels, click here. Philo is only available on a limited number of apps. The biggest gap is the lack of support for Android devices. Android users that subscribe to Philo must use Chrome to stream from the service’s website. Smart TVs and Blu-ray players: Devices based on Amazon Fire TV and Roku. Mobile devices and tablets: iOS and through Android devices’ Chrome browsers. For more information about Philo’s device support, click here. Philo lets you watch on up to 3 devices at once. For more information about Philo’s simultaneous streaming, click here. Each channel makes episodes of its TV shows and movies available for on-demand viewing. Philo does not have a separate on-demand library. 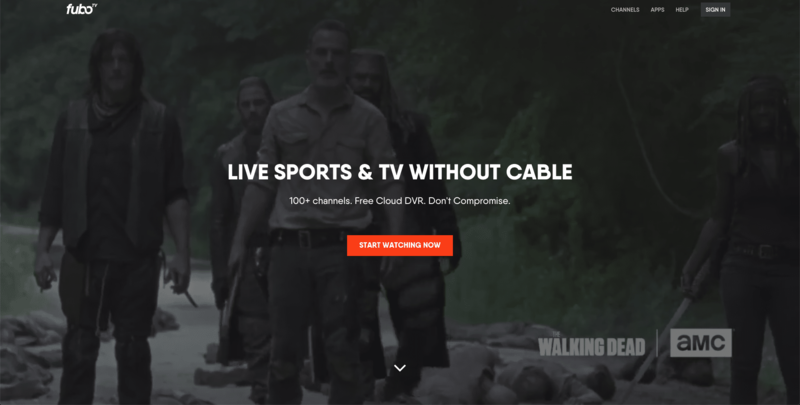 If you love sports as much as you love the zombies of The Walking Dead, then fuboTV may be the best choice for you. The service combines a full-featured channel lineup with the most sports-centric channels of any competing streaming service. AMC is a standard part of the fubo and fubo Extra subscription plans. There is typically a $5 discount off the posted price of both plans that applies to the first month of your subscription. For more information about fuboTV’s plans and pricing, click here. Local CBS, Fox and NBC broadcasts are available through fuboTV in select markets with national programming available on demand for all of the service’s customers. ABC is not available — and neither is ESPN, despite fuboTV’s sports focus. You can sign up for AMC Premiere at the same time you join fuboTV. There are also several other expansion options that will give you even more sports programming or premium movie channels. For more information about fuboTV’s channel list, click here. fuboTV provides a solid selection of apps for the most popular streaming devices. For more information about fuboTV’s device support, click here. You can stream to as many as two devices at the same time. Another $6 upgrade will let your family stream to three devices at once. For more information about fuboTV’s simultaneous streaming, click here. You get 30 hours of cloud DVR service with your subscription. A $10 monthly fee will expand the cloud DVR to 500 hours. For more information about fuboTV’s DVR, click here. FuboTV does not have its own on-demand library, but each channel provides on-demand content. Sony’s streaming service, PlayStation Vue, does not require a gaming console. With lots of channels and an easy pay-more-to-get-more subscription structure, it is a popular cable-replacement service. AMC is available on all four PlayStation Vue subscription plans, entitling you to an AMC Premiere subscription from AMC’s website. In addition to getting AMC, Sony offers expansion packs that add even more channels. Among all the streaming TV services, PlayStation Vue is available on the widest range of streaming devices. With a generous 5-device limit to simultaneous streaming, PlayStation Vue is the most family-friendly of the streaming services. While PlayStation Vue’s standard cloud DVR does not limit the number of shows you can save, it automatically deletes the recordings after 28 days. If a local channel is not available on PlayStation Vue, you can still watch that network’s TV shows on-demand. Each channel decides whether you get the full season or a limited number of episodes. AT&T’s DirecTV Now is a cable-like service that lets you watch more than 120 channels at a fraction of the price of cable. DirecTV Now uses a system of tiered subscription plans to offer fewer channels at higher prices than other streaming services. AMC is not part of the Plus or Max plans, so you must go with the more expensive options in order to get AMC Premiere. The channel lineup on DirecTV Now changes dramatically from subscription plan to subscription plan, so you’ll need to review your options carefully. HBO and other premium movie channels are also available through DirecTV Now. You can add another device to the standard 2-device limit on simultaneous streaming by paying an extra $5 per month. The standard cloud DVR service has a 20-hour cap and only lets you keep your recordings for 30 days. The feature is still in “beta” so DirecTV Now does not offer an upgrade. Most channels provide on-demand episodes of currently-running TV shows. However, you may get the entire season or the most recent episodes. Most Americans can subscribe to YouTube TV and stream their TV over any internet connection. In addition to YouTube TV’s single $50 subscription plan, you can add subscriptions ot premium channels. You can subscribe directly to AMC Premiere when you sign up with YouTube TV. Seven other premium sports and entertainment channels are also available. You can watch more channels on other services, but YouTube TV does a better job with local TV than anybody else. Odds are, you’ll get more of the local ABC, CBS, Fox and NBC affiliates with a YouTube TV subscription. If you use Amazon Fire TV devices, however, you won’t be able to watch AMC ad-free. YouTube does not work with Amazon. And YouTube TV subscribers can’t use AMC’s Fire TV app. There’s a 3-device limit on the number of devices that can use YouTube TV at the same time. The cloud DVR service is YouTube TV’s strongest features. With an unlimited capacity and a 9-month shelf life, it’s better than what you’ll find at any other streaming service. In addition to the traditional TV channels, you also get on-demand access to YouTube Originals. Subscribers to YouTube Premium can also use the YouTube TV app to watch normal YouTube content ad-free. You can watch AMC Premiere on Amazon FireTV with one of these streaming services: Philo, fuboTV, PlayStation Vue and DirecTV Now. As mentioned above, YouTube TV does not support Amazon Fire TV. You can watch AMC Premiere inside the fuboTV and PlayStation Vue apps. However, Philo, DirecTV Now and YouTube TV subscribers must download the AMC Premiere app. You can watch AMC Premiere on Roku streaming sticks or televisions with Roku built with one of these streaming services: Philo, fuboTV, PlayStation Vue, DirecTV Now and YouTube TV. You can also download the AMC Premiere app. You can watch AMC Premiere on Apple TV using one of these streaming services: Philo, fuboTV, PlayStation Vue, DirecTV Now and YouTube TV as well as the AMC Premiere app. AMC has always been part of the basic cable lineup, but it decided to go premium in 2017 when the network launched AMC Premiere as a subscription service. For a $5 monthly subscription, AMC Premiere offers an ad-free experience while watching The Walking Dead and other hit AMC shows. You can also binge entire seasons and watch extras of select series. AMC Premiere also produces exclusive content for its subscription service. As long as you have a pay TV service provider and an AMC Premiere subscription, you can get the ad-free experience through AMC’s lineup of streaming apps. YouTube TV subscribers, however, do not get access through AMC apps. They can only watch AMC Premiere through the YouTube TV apps.